Unidad de Evaluación e Investigación de Productos Antitumorales Instituto Nacional de Oncología y Radiobiología. Hybrid molecules obtained through conjugation of monoclonal antibodies and toxins constitute an approach under exploration to generate potential agents for the treatment of cancer and other diseases. A frequently employed toxic component in the construction of such immunotoxins is ricin, a plant toxin which inhibits protein synthesis at ribosomal level and so requires to be internalized by the cell. A hemolytic toxin isolated from the sea anemone Stichodactyla helianthus, which is active at the cell membrane level, was linked through a disulfide bond to the anti-epidermal growth factor receptor monoclonal antibody ior egf/r3. 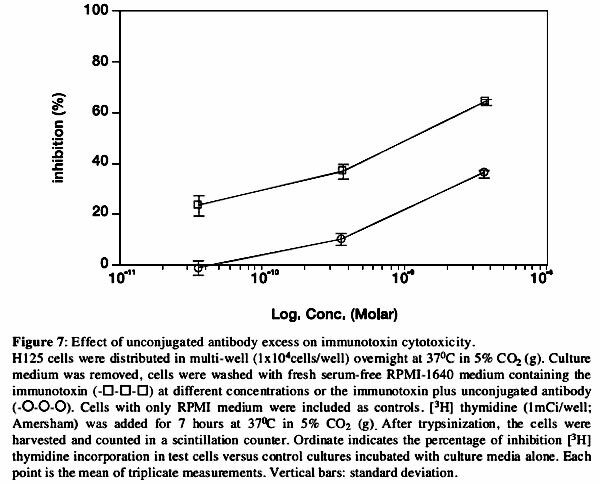 The resulting immunotoxin did not exhibit hemolytic activity except under reducing conditions. It was toxic for H125 cells that express the human epidermal growth factor receptor, but non-toxic for U1906 cells that do not express this receptor. Key terms: Epidermal growth factor, epidermal growth factor receptor, hemolytic toxins, immunotoxins, monoclonal antibodies. Immunotoxins are bifunctional proteins, constructed by covalently linking a monoclonal antibody and a toxin, that combine the binding specificity conferred by the monoclonal antibody (Mab) with the cytotoxic ability of the toxin, allowing to selectively eliminate those cells that express the antigen recognized by the Mab. In the last decade immunotoxins using the ricin A-chain (from Ricinus communis), abrin (from Abrus precatorius) and diphtheria toxin (from Corynebacterium diphtheriae) linked to monoclonal antibodies by chemical means have been extensively considered as an alternative in therapies against cancer, AIDS and other illnesses (Schnell et al., 2003; Zimmemann et al., 1997; Frankel and Kreitman, 2005; Engert et al., 1997; Youn et al., 2005). A second group of immunotoxins, usually called recombinant immunotoxins, is emerging in order to improve the limitations found with chemically conjugated immunotoxins. This class of immunotoxins provide enhanced therapeutic efficacy over conjugated forms and result in improved antitumor activity (Li et al., 2005; Kreitman et al., 2005). Toxins isolated from plants inhibit protein synthesis at ribosomal level and thus internalization of the complex by the cells is necessary (Carriere et al.,1985; Poncelet et al.,1984). Internalization is the rate-limiting step in cell killing kinetics (Youle and Neville, 1982; Jansen et al., 1985) and occurs commonly in Mabs directed towards leukocyte antigens, but it does not always occur, as in the case of antibodies directed against cells of epithelial origin. In this paper we will describe the construction of a hybrid molecule using a toxin that acts on phospholipids in the cell membrane and a monoclonal antibody which recognizes the human epidermal growth factor receptor (ior egf/r3), as well as their cytotoxic activity. The monoclonal antibody ior egf/r3 Mab of injectable quality was kindly supplied by the Center of Molecular Immunology of Havana, and was generated by fusion of murine myeloma SP2/0 with splenocytes obtained from mice that were immunized with a semipurified fraction of human placenta rich in the hEGF-R (Fernández et al., 1992). The ior egf/r3 Mab is of IgG2a subclass; it recognizes the H125 cell line, a lung adenocarcinoma that expresses hEGF-R and it doesn't recognize the U1906 cell line, a small cell lung carcinoma cell line (Suárez etal., 1997). The hemolytic toxin (HT) was isolated from a saline extract of the sea anemone Stichodactyla helianthus (Stoichactis helianthus). Purification was performed by acetone precipitation, gel filtration (Sephadex G-50) and cation exchange (CM-Sephadex C-50) using a modification of Devlin's procedure (Devlin, 1974) designed by Avila and collaborators (Avila et al., 1989). The HT shows an apparent molecular weight of about 18 kDa and isoelectric point of pH 9.8. It exhibits a potent cytolytic activity and a slight phospholipase A2 activity (Tejuca and Alvarez, 1994). 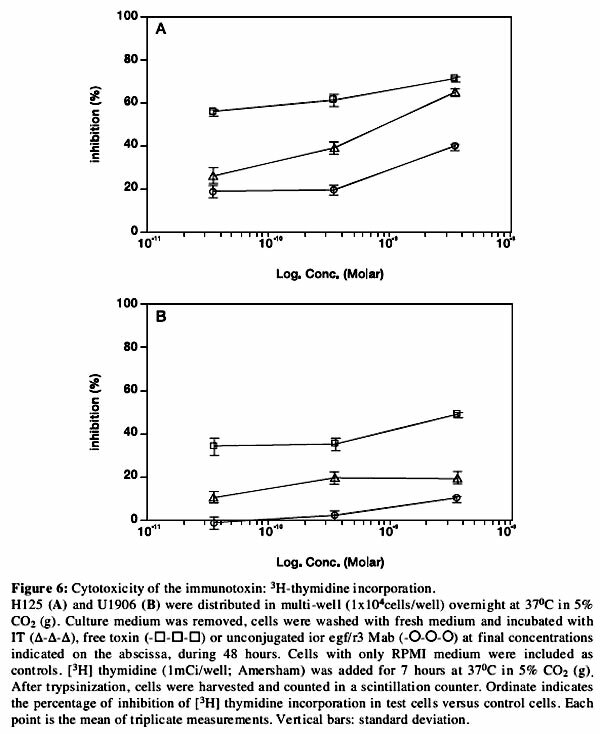 The toxin produces complete lysis of human erythrocytes at concentrations above 0.6 ng/ml. (Avila et al., 1989). The toxin was conjugated to the ior egf/r3 Mab using the heterobifunctional reagent N-succinimidyl-3 (2-pyridyldithio) propionate (SPDP, Pharmacia, Uppsala, Sweden) (Carlsson et al., 1978). The modified HT and ior egf/r3 Mab were obtained by reaction with an excess of SPDP of 3 and 70, respectively. Excess SPDP was removed by gel filtration chromatography on Sephadex G-25 with phosphate-buffered saline (PBS) 0.1MpH7.5. The extent of thiolation was determined by the variation of the optical density at 343 nm due to release of pyridine 2-thione groups, after reduction with 100 mM dithiothreitol (DTT) (Carlsson et al., 1978). The pyridyl disulphide-HT was treated with an excess of 50 mM DTT (40 minutes at room temperature). The removal of excess of DTT was achieved by gel filtration on Sephadex G-25. The reduced toxin was mixed with the pyridyl disulphide derívate of ior egf/r3 Mab at a 1:1 molar ratio during 72 hours, at 4°C. The conjugate was then separated from the free toxin by gel filtration on Sephacryl S-200, eluted with PBS 0.1M pH 7.5. The extent of conjugation was estimated following the release of pyridine 2-thione at 343 nm, and by measuring the hemolytic activity released after reduction of the conjugate. The qualitative identification of hemolytic activity in the chromatographic fractions was performed by adding 20 µL of the fraction to 100 µL of 1% saline-washed human erythrocytes and incubating during 10 min, at room temperature. After centrifugation (500 g, 10 min, 4°C) the released hemoglobin was estimated at 540 nm. 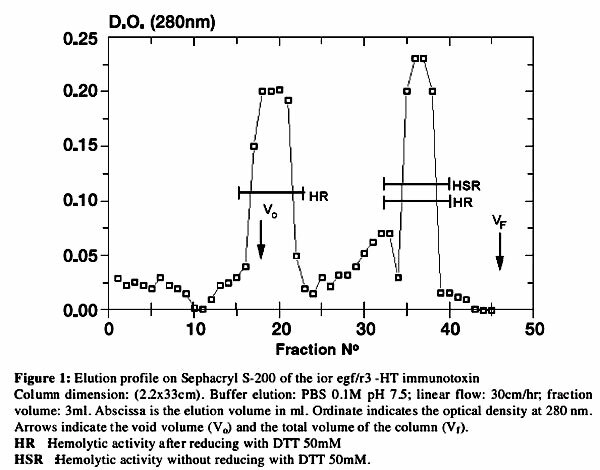 The quantitative assay of hemolytic activity was performed by continuously recording the decrease of optical density at 700 nm (Avila et al., 1989). In this assay, a hemolytic unit was defined as the amount of toxin which produces a decrease in optical density of 0.01 unit per second. Specific hemolytic activity was defined as units per milligram of protein (HU/mg). The analysis of the curves of the hemolysis kinetics was carried out according to the method described by Mácek and Lebez, 1981. A polyacrylamide gel electrophoresis was performed by the Laemmli method (Laemmli, 1970). The protein samples (50 ug) were mixed with the same volume of sample buffer, heated at 100°C during 5 min and applied into a 12% polyacrylamide gel with sodium dodecylsulphate (SDS). Coomassie Blue was used for staining protein bands. 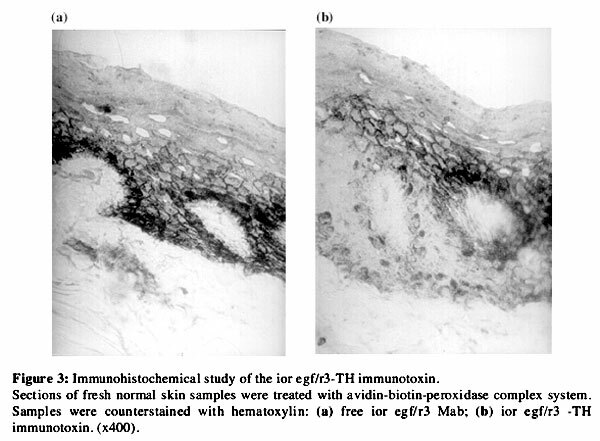 The avidin-biotin-peroxidase complex system was used (ABC-HRP, Dakopatts) in order to determine the specific recognition of the conjugated ior egf/r3 Mab in fresh samples of normal skin. (Wood and Warnke, 1981). The slides were treated with chromalum gelatin and dried, 1 hour at room temperature. The endogenous peroxidase activity was blocked with 0.3% hydrogen peroxide, 30 min, in ethanol solution. Slides were incubated with both conjugated and free ior egf/r3 Mab. After 1 hour at room temperature, they were washed in PBS, 10 min and the biotinylated antibody and the complex was applied for 30 min at room temperature. The slides were washed for a further 15 min in PBS and the peroxidase reaction was developed in a freshly prepared 0.025% Diaminobenzidine (DAB) in 0.02% H202 solution. The slides were counterstained with Mayer Hematoxylin, dehydrated, cleared and mounted in Eukitt. and unlabelled ior egf/r3 at the following concentrations: 0, 1,2, 5, 10, 20, 50, 100, 200, 500 and 1000 µg/ml at a final volume of 500 µl using a binding buffer (Tris 10 mM pH 7.4, BSA 0.1% and MgCl2 10 mM). After 1 hour at room temperature the samples were centrifuged at 500g during 20 minutes and the pellet was measured for radioactivity. Toxicity in vitro was measured on lung adenocarcinoma H125 cell line which expresses the hEGF-R and small cell lung carcinoma U1906 cell line which does not express the hEGF-R (Suárez et al., 1997). The cells were cultured in RPMI 1640 supplemented with 8% fetal calf serum. 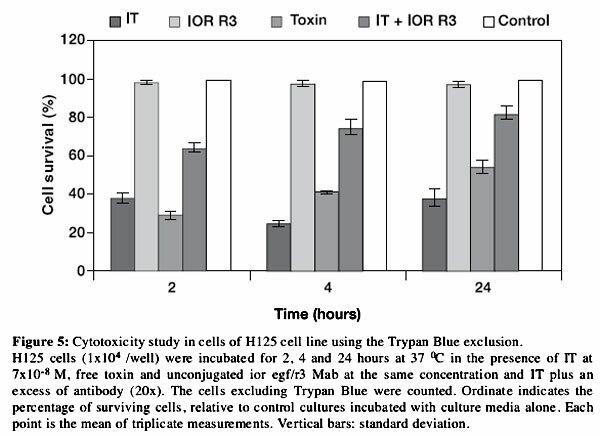 A dye-exclusion assay was performed by incubating 1x104 H125 cells/well for 2, 4 and 24 hours at 37 °C in the presence of the fraction to be tested and counting the percentage of the cells excluding Trypan Blue. For the inhibition of tumor cell proliferation experiments, the tumor cells (HI25 and U1906) were placed in a round-bottomed 96-well tissue culture plate (1x104cells/well) and incubated overnight at 37°C in 5% C02 (g). Culture medium was removed; the cells were washed with fresh medium and incubated with the samples (100 µL) during 48 hours. Cells with only RPMI medium were included as controls. [3H] thymidine (1mCi/well; Amersham) was added for 7 hours at 37°C in 5% C02 (g) After trypsinization, the cells were harvested and counted. The [3H] thymidine incorporation was determined in a scintillation counter (LKB). All counts were expressed as the percentage of [3H] thymidine incorporation in test cells versus control cells. After the conjugation reaction, the hybrid molecule did not exhibit hemolytic activity at a concentration of 15[ig/mL and after reduction with DTT, the hemolytic activity was recovered. Specific hemolytic activities of the unconjugated toxin and the hybrid molecules were 0.34 U/µg and 0.1 U/µg, respectively. The estimated conjugation ratio was 3 moles of toxin per molecule of antibody. The behavior of ior egf/r3 Mab linked to the toxin was similar to the free antibody. Figures 3 a and 3b show that the recognition in fresh samples of normal skin of the IT was weaker (moderate) than the free Mab at the same concentration by IHQ. A similar result was obtained when we tested the binding of IT using a radioreceptor assay. These experiments showed that IT recognized the EGF-R in the membrane at a similar level to free ior egf/r3 Mab at 5 µg (Fig. 4). The inhibition of thymidine incorporation assay showed the toxicity of the immunotoxin on H125 cells at concentrations between 10-11 and 10-8M. The same concentrations were not toxic for U1906 cells. 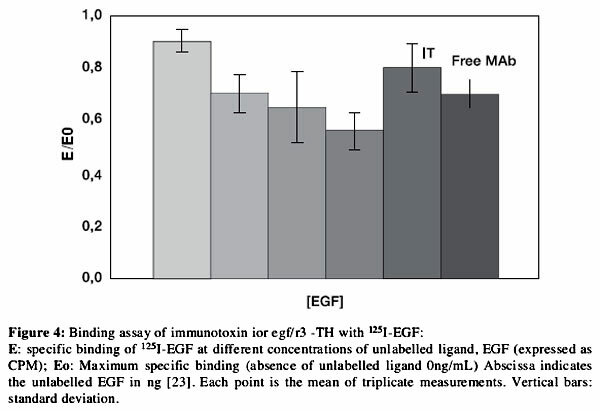 Unconjugated ior egf/r3 was not toxic for either type of cell lines and free toxin was toxic for both. (Fig. 6). This assay also confirms that an excess of unconjugated antibody prevents the toxic effect of the IT on HI25 cells (Fig. 7). 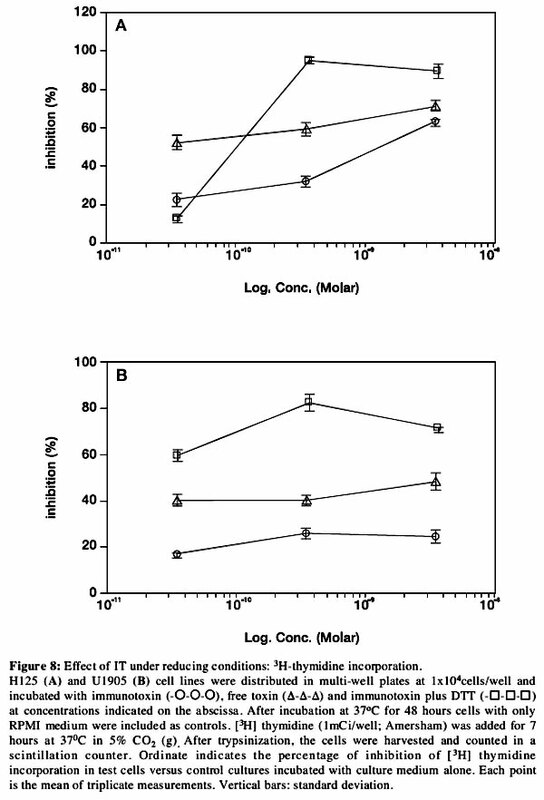 The difference in sensitivity between H125 and U1906 cells was abolished under reducing conditions, indicating that both types of cells were sensitive to the free toxin (Fig. 8). ior egf/r3 Mab , IT and hemolytic toxin were incubated at 45°C, 52°C and 60°C, in order to predict the stability of IT and its components, at 4°C. Biological activities of the IT, unconjugated antibody and free toxin were tested at several times to verify the effect of temperature. We found that the IT might lose half of its activity after 1 -1.5 years stored at 4°C (Data not shown) based on Arrhenius's kinetics. (Frost and Pearson, 1968). The results show that it is possible to link ior egf/r3 Mab to the hemolytic toxin obtained from S. helianthus by means of disulphide linkage provided by the heterobifunctional reagent SPDP. The properties of the immunotoxin built by this method are coincident with those of similar molecules that have been synthesized previously (Avila et al., 1988; Avila et al.,1989; Beutler, 1971). The immunohistochemistry and competition with 125I-EGF assays indicate that the MAb retained its biological activity in the immunotoxin. Nevertheless, we found a slight decrease in the recognition of the hEGF-R by the immunotoxin. It might be due to some steric hindrance for the complex ior egf/r3-HT. Due to the higher expression of the EGF-R in HI25 cell line, the immunotoxin was more toxic on this type of cells than on U1906. The cytotoxic activity of the HT in the complex is targeted by the kinetics of binding between ior egf/r3 Mab to its hEGF-R, therefore the activity depends on the quantity of available receptors and the binding reaction rate. The protective effect of an excess of unconjugated Mab in HI25 cell line treated with the immunotoxin, is the result of the competition for the hEGF-R by both molecules. The binding of the free MAb to the receptor increases with time. According to the kinetic pattern proposed by Yanai et at. (1991) for EGF-hEGF-R union reaction, there is a probability of reversibility in this reaction. All this could be the cause of increment in cell survival for incubation periods greater than 4 hours (Fig. 5). 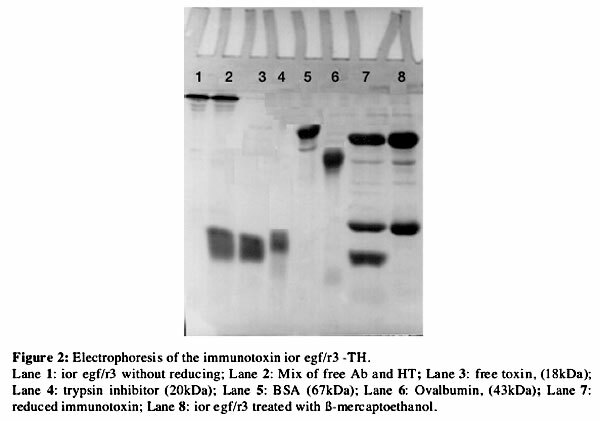 The immunotoxin inhibited cellular proliferation after exposure to reducing conditions in a similar way as free HT in HI25 and U1906 cell lines. Therefore the toxicity effects observed in HI25 cell line and non-toxicity effects for U1906 cell line when they were exposed to IT, the protective effect observed when there is an excess of free ior egf/r3 Mab and the loss of differential toxicity when the IT is exposed to reducing conditions all indicate that the toxic effect of the conjugate on these cell lines is through ior egf/r3 Mab moiety of IT. The preliminary study about the thermostability of ior egf/r3 -HT immunotoxin predicted that half of the biological activity (recognizing MAb and toxin hemolytic abilities) would be lost after 1.5 years storing at 4 °C. Although these results are a rough estimation, they showed that the ior egf/r3 -HT is a stable molecule (data not shown). This is an important issue for patient applications in general. Lung adenocarcinoma is a disease resistant to chemotherapy and radiotherapy treatments. The selective toxicity of the immunotoxin on H125 cell line (lung adenocarcinoma) makes this molecule an interesting alternative for the treatment of this kind of lung cancer. In most cases, toxins such as ricin and its subunits, have been coupled to MAbs and internalized in cells order to inhibit intracellular protein synthesis. We have presented here an immunotoxin involving a hemolytic toxin that is active on the cell membrane as a system which does not need internalization into cells. This feature gives an advantage over ricin-immunotoxins and could be a good choice for building immunotoxins using antibodies that target antigens which experience no endocytic internalization, as it happens with many kinds of carcinoma-antigens like lung and head and neck cancer.